Emmy is what we call a big producer. In her short life, she had added more than her share of pups to the local dog population. Coming into heat twice each year, she had not just had multiple litters, she had had big ones -- 9 to 13 puppies in each. In total, Emmy had produced close to 50 puppies and no one can refute that that equals…. a big producer. Emmy’s owner contacted me in early spring to ask if the Northern Dogs Project would come to her community. Her dog was always having puppies and people accused her of not taking care of her because Emmy was always so skinny. Having pups requires a lot of energy and even with two meals a day, I had no doubt that Emmy was fighting an uphill battle. Twice a year she was carrying and then providing for each litter of puppies and she most likely had a hefty load of worms to top it off. Intestinal parasites are common in adult dogs and cats that forage on their own or are fed wild meat. These worms pull nutrients from the dog’s system which adds to the energy burden of a pregnant or nursing female like Emmy. Emmy was first on the list of dogs to be spayed when we arrived. But an hour after MJ and Martine had begun surgery, she hadn’t shown up. Three hours later we were closing down day one of the clinic with still no sign of Emmy. Later that evening, Emmy’s owner let us know that Emmy had disappeared that morning (which was uncharacteristic of her) and she thought that she had probably gone off to have her puppies in the quiet spot, maybe in the forest. The problem was not spaying a new mama, the problem was that Emmy might not make an appearance before we left for our next community. I told her owner that if she found Emmy, to make sure to bring her to the clinic first thing in the morning, with her puppies (assuming that was what she had been up to). 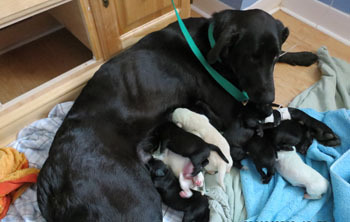 At ten o’clock that night, there was a knock on the door – there was Emmy’s owner with Emmy in the back seat and a newborn litter of 10 beautiful pups. The Northern Dogs Project aims to change the attitudes and behaviours of dog owners in each community. That way people can understand that owning a dog is about taking responsibility for not just the health and welfare of that dog but their puppies as well. Emmy’s owner understood this. She had been through multiple litters with Emmy and did not want to have anymore. She also realized that if she distributed the pups to others in the community, there would be 10 unspayed and unneutered dogs producing pups in half a year. We agreed that the pups would stay with Emmy for now, but that when someone was travelling south, I would head north to a halfway point to meet the pups and bring them south for rehoming. At three weeks of age, the pups will stay together until they are 8 weeks old at which time they will be separated into pairs and put into foster homes while they await their new families. 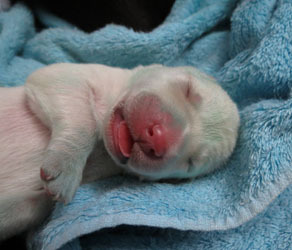 A great owner, a great dog, a litter of super cute pups and an objective of the Northern Dogs Project met.